Bill Krueger: "It's really about localization for us now." TRAVERSE CITY, Mich. -- After 30 years of building autos in the United States, Nissan is turning up the pressure on its suppliers to locate their operations closer to Nissan's assembly lines in Tennessee and Mississippi. 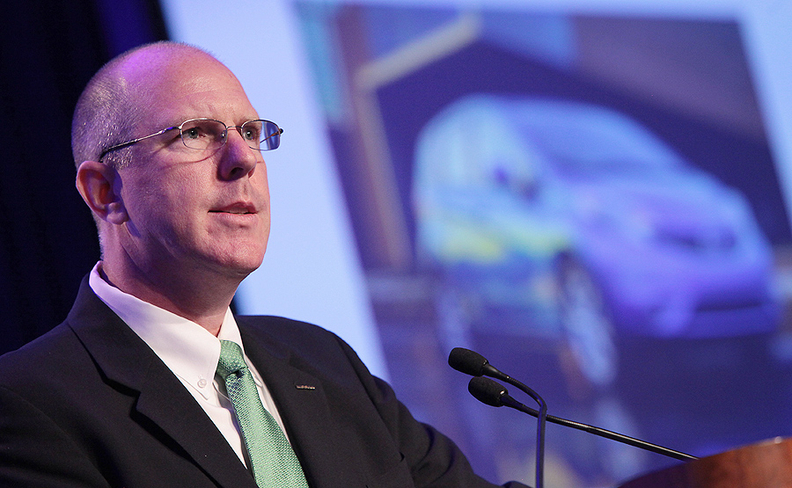 "I want to see our key suppliers at the grocery store," Bill Krueger, senior vice president for manufacturing and supply chain for Nissan Americas, said Wednesday at the 2013 CAR Management Briefing Seminars here. "When your suppliers are your neighbors, you talk to them every day. It's a better kind of relationship. When you put something on a rail car or a tractor trailer and move it two or three states away, we lose that connection." To bring down transportation and final delivered parts costs, Krueger wants about 100 parts to be produced with a very short distance of his plants, representing dozens of plants. And after decades of U.S. manufacturing, Nissan is only about a fourth of the way there, he estimates. "It's really about localization for us now," he said. "We're going to be convincing the supply base to move closer to us and move with us to gain more efficiencies, shrink down inventories and speed up the collaboration. "Transportation counts now. It's not just, 'What is the lowest possible price we can get at your door?' It's now, 'What's the lowest price when it reaches our door. And what will be when it gets to the car dealership?'" Krueger's operation is on a tear. This year, Nissan will launch Sentra production in Canton, Miss., Mercedes-Benz engine production in Decherd, Tenn., and output of the high-volume Rogue crossover in Smyrna, Tenn. Before its fiscal year is over next March, Nissan also will start a new second assembly plant in Aguascalientes, Mexico. Next year, it will move its Murano crossover from Japan to Mississippi. Krueger says he is sympathetic with suppliers and sub-supplier companies who were damaged by the 2008-2010 economic crisis who are still reluctant to expand into new facilities. But he says Nissan represents a different supply chain opportunity. "We haven't been shutting down. We have a cadence of new products and programs going forward," he says. "We're growing. My capital budget for last year and next year is $5 billion. We are putting our money where our mouth is. "The Rogue is going to be a big volume this fall. That's a substantial business," he reasons. "If you're really still nervous and you want to stay away, chances are you're going to have to shrink in our business going forward."